Refer a friend, if they sign up for a 12 month cooler rental you get to choose from either of 3 x 15L Bottles on your next delivery, or $30 Bunnings Voucher or 2 x Adult Movie Tickets. Aussie Natural is proudly WA owned and operated, and we strongly value our level of customer service. 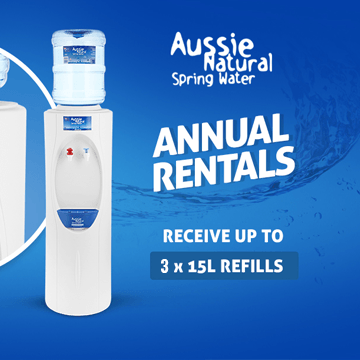 The best way to save on fresh filtered, spring water is through our annual rentals from as little as 28c per day, also receive 3 Free Welcome Refills as part of your rental. *Annual rentals are billed on an annual basis, per day or monthly prices are for comparison purposes only. Enquire now for more information on annual rentals, or call us directly on 1300 360 332.